If you ever thought that, you are not alone. Eating healthy on a budget is a challenge people just like you wrestle with every day. But you don’t have to! You can feed your people real food for under $1 per serving. It isn’t magic. It’s just the right recipes and a simple strategy. Many of us struggle to eat well on a tight budgets. As a published author, passionate real-foodie, and frugal shopper, I took some of the most budget-conscious recipes and methods and compiled them into Dinner for a Dollar: Real food recipes for under $1 a serving. 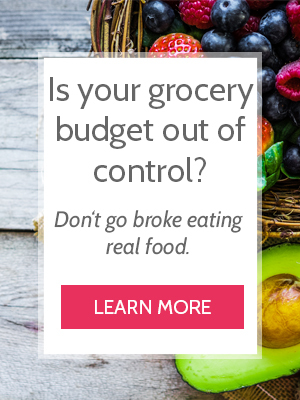 Slash your grocery budget in half while eating whole, real food! If you follow the recipes and tips in Dinner for a Dollar, you will save money and eat healthy. Don’t keep blowing your budget while caring for your health. The book you are about to read will equip you to save money, eat well, and serve dinner guilt-free! You CAN save money and eat healthy. We will show you how. Click here or the button below and start saving today! The answer is yes! No problem. You can download the Kindle app to your smartphone or tablet (it’s free!). Then when you click on the link to my book, Amazon downloads it to your Kindle app. Hope this helps, and happy cooking!